Efficient supply chain management is necessary to keep your business competitive in a globalized economy. Our logistics services provide the necessary skills and expertise necessary to effectively manage a global supply chain. Our dedicated groups of logistics coordinators oversee the entire process from start-to-finish, allowing you to focus on value-added functions like new product development and sales. We are experts in dealing with all aspects of the supply chain will provide you with comprehensive import/export, shipping, and warehousing services. Having an expert logistics team on your side can help drastically improve operating margins and profitability. 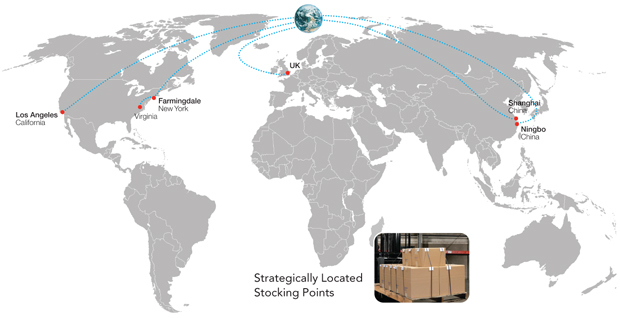 EHC maintains key manufacturing and stocking locations in the US, Europe and Asia giving our customers greater flexibility with their shipping and inventory needs.